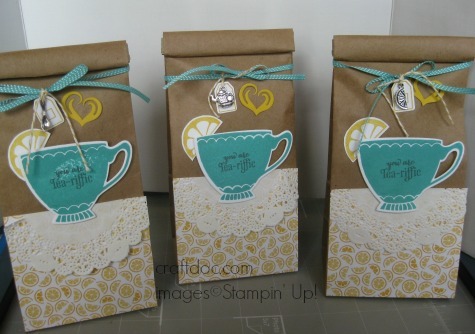 I made some cute gift bags for my Stampin’ Up! On Stage roommates. These were basically CASED from the Occasions Catalog using the “A Nice Cuppa” stamp set and matching framelits and paper stack, and our Petite Cafe Gift Bags. I went with a lemon theme and filled my bags with lemon green tea and lemon drop candies. And of course chocolate – have to have that, even if it does not fit the theme. -The Stampin’ Up! doilies and charms are fun to use with this suite of products. -The cafe bags are lined so you can fill with cookies or a pastry as well. You can find these at my website shop.